Multiply your options for fun with Multiplication BINGO! Beginners and experts alike have an equal chance for BINGO, and everyone learns more about Multiplication know-how with every round! Choose a caller. The callers says which BINGO version will be played. Example: "This game will be Vertical BINGO". The caller spreads the Calling Mat out, then shuffles the Calling Cards and stacks them face-down by the Calling Mat. using the answer shaded in grey at the bottom, covers the correct space on the Calling Mat with the card. Use a chip to cover the answer on your Playing Card that matches the equation called. 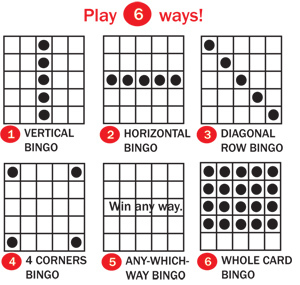 When someone covers all squares for the variation being played, he or she calls "BINGO", then says the covered numbers for the caller to check against those covered on the Calling Mat. TIP: Get to know your multiplication fact families through to 12. Practice multiplying on paper, with counters, and in your head. Students enjoy playing, and winning. Increases multiplication knowledge.